Veritas is one of the biggest wine merchants of Budapest, dealing with hundreds of Hungarian and international wines and spirits. 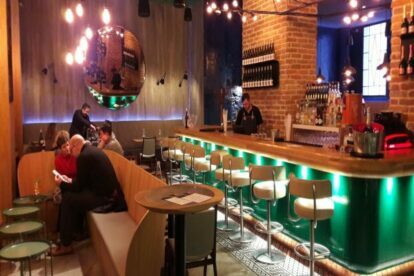 Their Dohány street location in the Jewish Quarter, a well-known wine store, recently expanded with a wine bar and restaurant. The area is quite rich with history and offers a lot more than just walks. The place is homely, can be cool for wine gurus to experience new wines or simply host a casual meet-up with friends. Their kitchen is also a pleasant surprise! You can choose from bar foods, Hungarian tapas and gourmet courses as well. The great spaces and modern design create a terrific atmosphere! “Good food, good wine and good friends” they say in their promotional material. I can agree with that! I like the casual service which is friendly and professional at the same time. They will guide you well, without a doubt! Clink with a local choice: you should try the Hungarikum bull’s blood cuvée and the Tokaj noble wine! Offline Budapest tips? Get our iPhone / Android app!